How do you choose the best hiking monopod tripod? I understand your frustration. You want to have an aid to your hiking activities AND you want to have a good support for your camera that is convenient to use. This article will help you decide if a hiking stick, tripod, or monopod is right for you when you take off on a photo excursion into the wild. Some hikers may think this is overkill, but it might make sense for you to have an all in one gadget that serves as a monopod, a tripod, and a hiking stick. Hiking monopods may be the right tool that helps you with two of your hobbies, taking great photos and walking. The good news is that you have lots of options. The question is whether you really need a tripod and a monopod when you go hiking into the woods on your next photography shoot? It really depends on your intended subject matter and your shooting style. If you're only photo hunting for birds and wildlife and your hiking is strenuous, you're better off taking just a monopod. If you're shooting a variety of subjects and want to be well prepared for any situation, a tripod-monopod combo might be the perfect accessory. Not shooting any quick moving action? Leave your monopod at home and carry a good solid travel tripod. There will be at least some compromise in performance when you combine three functions into one piece of photography equipment. 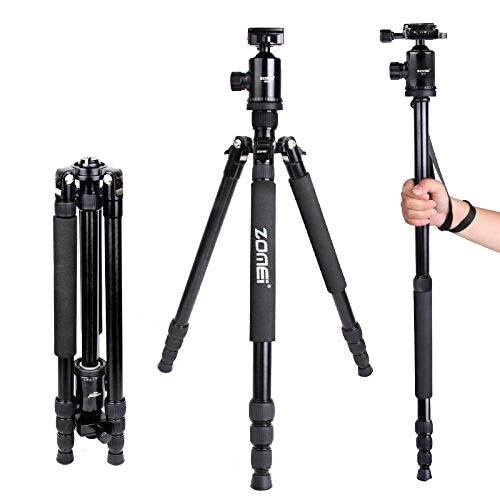 One of your options is the increasingly popular tripod-monopod combination. A lot of manufacturers now offer these accessories. Most are not really designed to be used as hiking sticks too. Some are very light and would be easy to carry along when you do hike. Essentially they are just tripods with a removable leg. You attach the tripod head to the removed tripod leg and you have a fully functional monopod. The biggest advantage you get with using one of these is that you have a fully functioning tripod with different tripod leg and camera angle positions available. 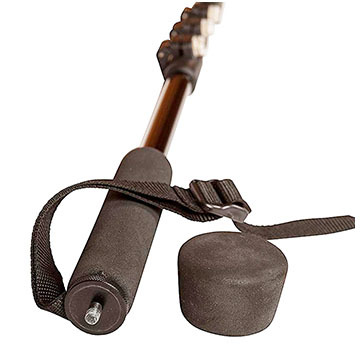 You also have the option of getting a sturdy walking stick that doubles as a camera monopod. They are lightweight and collapse compactly. Their weakness is that they cannot take a ball-head for different angles. You've lost the tripod function, but with high IOS settings and high shutter speeds you can avoid having to use a tripod all-together. The Trekpod (by Trek Tech) tripod-monopod is strong enough to use for hiking and, to me, it is the best options available. One of the disadvantages of standard hiking monopod combo is the lack of a ball head. The Trekpod has it all. 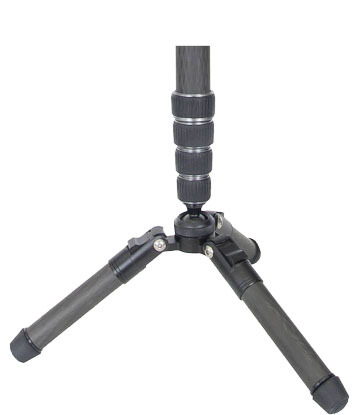 Monopod design, wide tripod legs. and a ball head. There is an XL (extra light-carbon fiber) version of the Trekpod too. Here is the link if you want to read up on all of the versions of the Trekpods. One downside: There is only one angle for the legs. That's no good if you're shooting on an uneven surface. The monopod below has no tripod legs and you cannot attach a ball head. This accessory gets great reviews, but it comes up short if you're looking for a monopod-tripod combo to hike with. You can shop for any one of these variations of the hiking monopod tripod combo wherever you buy traditional monopods. The Trekpods are a little tougher to find, as they are a bit more unique in their design and not as well know. You can find them on Amazon. This article was written because I came across significant demand by searchers like you who typed in the keywords monopod tripod hiking. My guess is you were looking for a good combination of a tripod and a monopod that would be good for hiking. I hope this article gave you at least some help. Please consider subscribing to my newsletter. I don't send that many newsletters and I don't share your email address with anyone. Try one of these links to see if it's what you are looking for. The reveiws are helpful even if you do your shopping elsewhere. Here are two tips for getting sharp images when using a monopod tripod hybrid. Let it settle. Vibrations are normal when you are supporting your camera and lens, especially with a single extended pole. Wait a few seconds after you let go of your camera before you trigger the shutter. Use the timer function or use a remote shutter release. This will prevent you causing any subtle camera movement when you make your exposure. One of the best accessories to get for a hiking monopod tripod combo is tripod leg covers. They give you added cushion and keep your hands from getting cold during your hike. Shoot more photos. Watch less TV. 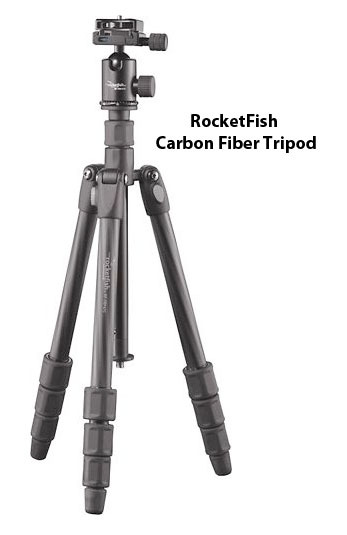 I've used this Rocketfish as a tripod and hiking monopod by shortening 2 legs and using the third as a walking stick. It's not as sturdy as a dedicated walking stick, but counting my 2 human legs, it's still a third point of contact as I am navigating up or down elevation changes I encounter while hiking. I have one of the Koolehaoda Monopod/tripods and it's great for shooting video, but it's not really suitable as a hiking stick at all. Manfrotto folding feet can be attached to basic monopod to turn it into a quasi tripod, but this is a poor design for hiking. This is a much more stable construction. The feet are far thicker and more robust and provide more stability than the longer thin feet of some monopod designs. Tripod/Monopod combos let you carry both a tripod and a monopo dalong with you on your hike. The big disadvantage of this setup is you have to assemble or disassemble the tripod to use your monopod leg each time you want to switch functions.